Our lobster dishes are firm favorites at The Copper Clam. Caught only a stones throw away from the restaurant on Brighton Beach, we can guarantee that our lobsters are fresh and locally sourced. Served chilled or grilled with garlic butter, our delectable lobsters are available individually or as part of our seafood platters to share. You can even find our super fresh lobster in our seafood cocktail. Our Seafood Platter with Cornish Crab combines local lobster with local crab, finished off with fresh oysters, mussels, prawns, clams, scallops and crayfish. Perfect for a hungry couple! One of our favourite dishes! 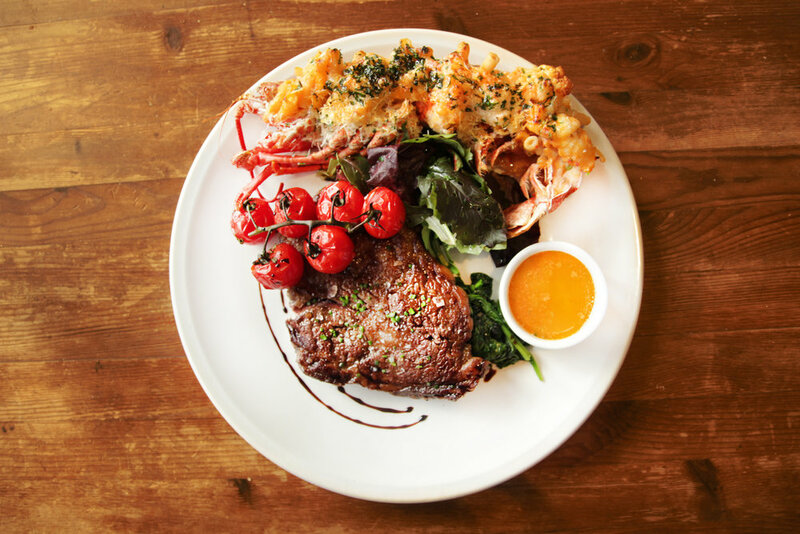 Here we have our 10oz Sussex Ribeye steak complete with 1/2 local lobster and mac ‘n’ cheese on the side. Perfect for those with an appetite!